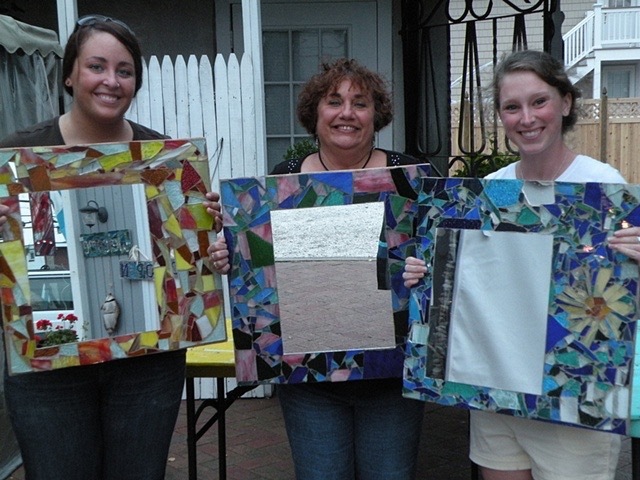 Have You Tried Our Friday Happy Hour Mosaic Mirrors Class? People ask us all the time: Do you have sip and paint type classes? And the answer is yes! We offer a delightful happy hour mosaic mirror class! This class is so much fun- great for girls' night, a birthday party, a date night, or even a bachelorette party! We tend to run this class Friday evenings in the summer, but in the off-season, we are happy to book a class whenever it is most convenient for you! In this class, each person gets to make a large sized (about 18"x20") mosaic mirror on a reclaimed wood surface. We supply all the materials and some light refreshments and the beer or wine of your choice. Looking for a Fun Art Class for Your Homeschooled Kid?